this COULD be a bad thing..
well, maybe.. if you have a sonny's addict in the house. well, if you live anywhere in the southeastern party of the good ol' USA..
you'd know that's a bbq joint..
some swear it's the best bbq ever. i am NOT one of those people..
i am also NOT the sonny's addict in the house. after probably close to 20 years of my mama working there..
i still just 'tolerate' it. don't get me wrong.. it's not that they have BAD bbq..
i am just not a bbq person. period. i'd settle for a heaping helping of pretty much anything over bbq. but... i do love there pulled pork. i prefer more... latin inspired pulled pork..
and because i can't always make chicken & pasta for dinner..
AND because crock pot meals on soccer practice nights are good..
i found this little recipe nestled in amongst other crock pot recipes on my pinterest board. it's from 'the girl who ate everything'. it's simple. which is good. and has everyday, ordinary, CHEAP ingredients. that's a triple bangarang in my book. i have no idea where that phrase just came from. did you know i'm NOT a food photographer/stylist? if you didn't, you do now..
but i'm gonna go on the theory that the ugliest food, sometimes tastes the best. 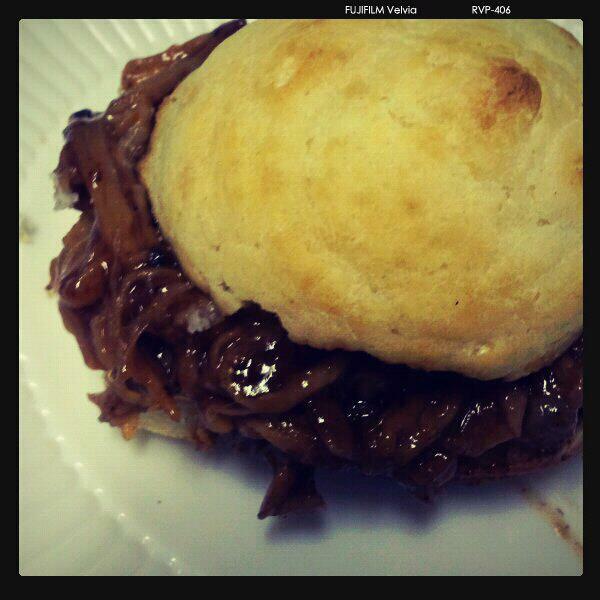 if you are a sonny's fan.. it tastes just like their pulled pork simmered in their sweet sauce. if you have no idea, or could care less about sonny's bbq... you will still like it. here's the link for the printable recipe. but you REALLY won't need it. our magical combination, lest you think you need primo ingredients... a .50 cent chek root beer from winn dixie & a bottle of kraft honey hickory smoked bbq sauce. the cheap kind. no fancy schmancy bbq sauce here. & pour 18 oz of sonny's sweet bbq sauce out of your GINORMUS bottle of bbq from sam's club. or open up the equivalent of single serving packets you have hoarded away in a drawer in your kitchen. 'cause you KNOW you do. oh man...i can smell them from here! we here in cali LOVE bbq. i pretty much make my pulled pork the same way...which reminds me to get a roast at sams today. gonna have some rainy weather this week and i need to bust out my crock pot! thanks for sharing your love//hate relationship with bbq. ps: i sprinkle cheddar on my sandwiches! yuuuum!